New Zealand’s greatest writer Katherine Mansfield, the woman whose career was cut tragically short after she had reinvented the art of the short story, once wrote, “I want to make my own country leap in the eyes of the Old World”. It must have started the fad. You can see them do it off the Skytower every day. Auckland’ signature landmark at 328 metres, Aucklanders delight in reminding you that it is it is the tallest building in the Southern Hemisphere. It is best viewed from the sea, because the city was built by seafarers who used water as a throughfare, and it has never quite lost that connection with its watery grandmammy. The city slogan, City of Sails, (and its reputation as the only welcome to match Galway’s in the Volvo Ocean Race) reflects the huge level of boat ownership. The city streets still look like an add-on to the seafront, unsure what hey wanted to be until in a frenzied few decades of development they became the goose feet of high rise development, including the Econ building which looks like its toilet seat is in need of putting down. That ancient quayside has been reinvented. Princes Wharf is a hub of trendy bars and eateries, such as the Euro from which you can admire the stall ship that starred in the Onedin Line, or the gut stretching Wildfire, where slabs of steak are cut off for diners in the Brazilian style. 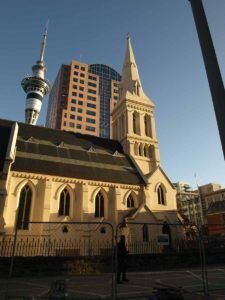 A few blocks from the skytower they play recorded Gregorian chant in St Patrick’s Cathedral as people escape the hubbub around and stop by to contemplate. St Patrick’s spirit at least, must have passed through here before, because New Zealand has no snakes. Here, or at least on the church that preceded it, you can image the homesickness of Cork-born Thomas William Croke, Bishop here before he returned to Cashel to become the founding patron of the GAA and have one of Europe’s greatest sports stadiums named in his honour. The mainly English settlers began to arrive in the 1840s, displacing a peace-loving and well organised Maori culture, anxious to trade with the new arrivals. Until the new arrivals, as the English had a tendency to do, decided they owned the place they have just arrived. My favourite character was Te Kooti, kidnapped by Mother England’s colonists and sent without trial to the Chatham Islands. He captured an English supplies vessel, persuaded them to bring him back to New Zealand and died a free man, having preyed on his imperial aggressors form the mountains like a Maori version of Fíach MacHugh O’Byrne or Michael Dwyer. Auckland was one of the places they had settled and by 1840, it didn’t belong to them anymore. Nor did many of the animals who called New Zealand home survive the new invasion. Extinction is a way of, er, life here. No other country has seen the devastation that New Zealand has over the past 160 years. The birdsong that Captain Cook listened to on the famous landfall in Pickersgill Harbour is all but gone. The islands used to have about 100 varieties of birds. About half are gone. Cad a dhéanfamaid feasta gan birdsong? New Zealand has not predatory mammals. When the Maori arrived they hunted the lightless geese to extinction. The Europeans followed with rats, cats, dogs and stoats. And within a short sail of Auckland in 1980s, somebody decided to recreate what it used to have been like. The photographs of the island of Tiritiri Matangi in 1980 make it look like a shorn sheep. The place is bare, deforested by fire and grazed by sheep. It was an unlikely ark, but they de-ratted it and de-mamalled it, replanted indigenous trees and encouraged native birds to nest there. Now you would think it had survived the Europeans, if it were not for the tourists trampling along the man made walkways. Okay, it is a zoo, rather than a piece of nature miraculously preserved. But the balance between man and nature has been tipped terminally long ago. The new balance is between the ecologically commercial and the commercially ecological. Ferryboats of tourists means cash for conservation. The group is led by two re4tired school teachers, Angela Bradley and Des Mann. They are joined by your correspondent and Peter Joost, who describes himself as a fanatical bird watcher, that rarity, a Latin teacher and even more rare, a Latin teacher in Manhattan. After about three minutes I am enthralled by the birdsong, the recreated forest, the sense of being close to unhurried, unfrightened birds. After ten minutes I can my saddleback form my Pi waka waka, or fantail. Fantail. In fact the fantails are coming by to play with us like extras in a Hitchcock movie. You get the sense they are laughing at us. It dawns on me that I am the only one of the group that doesn’t know the mating call of any bird. I feel the cold hand of extinction on my shoulder already. All the islands here are volcanic. In fact the whole of Auckland’s harbour is volcanic. The boat-driver reminds us there is a10pc chance there will be another eruption in the next 100 years, out of a weak spot in the earth’s surface. No wonder the fantails were laughing. Extinction looms. When he came from Ireland in 2000 Néill Sperath says he thought of Auckland simply as a gateway. “I quickly discovered I was wrong. It is a whole destination in itself”. Néill, who is Peadar Kearney’s grand nephew and once sang on stage with Luke Kelly, now runs TIME (Twin Integrated Maori Experiences) unlimited with his Maori wife Ceilihe, offering kayak and kite fishing from the beautiful beaches in the environs of the city. Thirty minutes drive and you might be in the wilderness. He climbs Mount Donald McLean to show the view al the way back to the distant city skyline, dominated by Rangitoto Island, youngest of the 48 volcanoes of Auckland at 600 years old, and the Skytower, which is 11 years old. Our mission is a kite fishing on Whatipu beach, an extension of Keri Keri where the Piano was filmed. It is a gusty day that throws rain showers on us and the beach is empty except for one diehard fisho. Néill comes from Garyspillane in Tipperary and learned to fish on Lough Derg. He is offering a world first kayak fishing experience and among the first kite fishing experience, in which a kite is flown to take the fishing line up to a few kilometres offshore. When we retrieve the line we have a spotted dogfish, or lemon fish as he chippers like to call it. According to Néill, North Island has more Maori culture, the best beaches and the best wildlife.